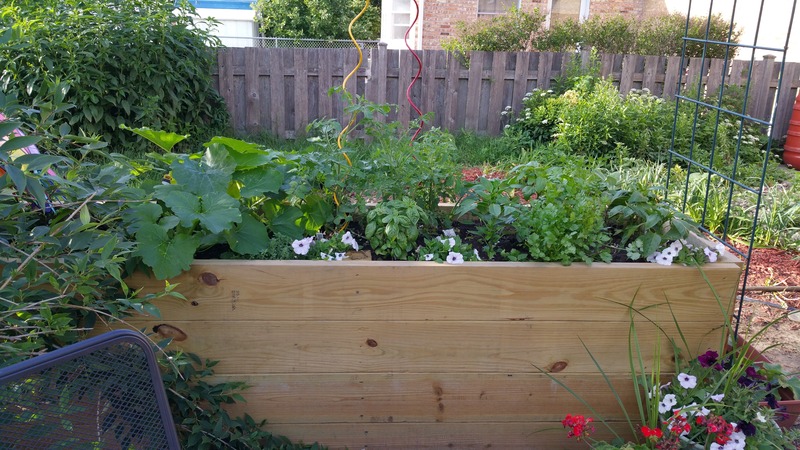 Container Garden as of June 16. Despite drenching rains and lack of sunlight in Chicagoland, our new DIY container vegetable garden is off to a solid start! Below are photos from June 1; above is the progress made by June 16. Just over two weeks! 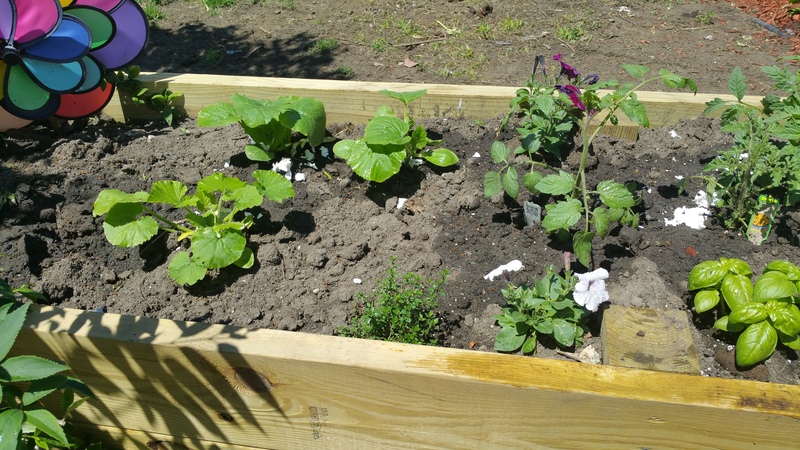 We also have cucumbers in a large planter that are starting to grow up the trellis at the right end of the container. The cilantro must love the humid weather. I’ve already harvested one batch and used the dehydrator to dry it for the winter. Even dried, it smells wonderful! Despite using the cilantro in several different recipes over the last week, it looks like I might be dehydrating even more this coming weekend. My new favorite burger for the grill is my Summer Thai Chicken Burger, which features the fresh cilantro. The basil, too, has grown by leaps and bounds, and I hope to enjoy it with some fresh mozzarella and tomato in salad tonight. We won’t have enough for pesto this year–but next year we’ll add more basil to the garden. We’re hoping the tomatoes grow stronger once we get some steady sun and heat. The green peppers may need to be thinned out. They had me worried for a little bit. We had some signs of cut worm a week or so ago. However, crumbled egg shells around the base of the peppers and tomatoes stopped any further damage. (You can see some of the egg shells around the base of the plants in the bottom right photo.) Crumbled egg shells also add calcium to the soil. Since we only used one bag of organic potting/vegetable soil in the container (the rest being dirt dug from the patio project), the soil needs all the nutrients it can get. We’re planning a second raised garden for against the north fence next spring. We’ll dedicate it to the peppers and tomatoes, since the squash seems to love its current habitat. 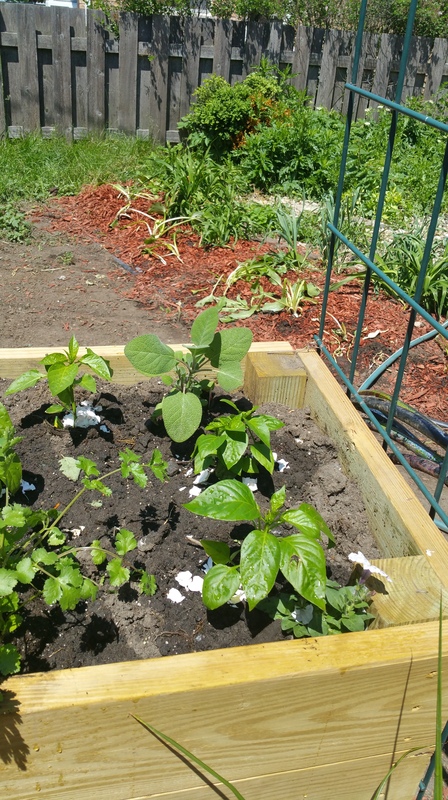 Cilantro (on left), green peppers, and sage (back, right) on June 1. Zucchini, tomato, oregano, and basil on June 1. We recently purchased some non-GMO, organic heirloom beet seeds from SeedsNow.com. According to grow charts, we can plant beets in late summer for a fall harvest. In August, I’ll set the seeds to germinate in the kitchen window, then we’ll replace the bell pepper plants with the beets, once the peppers are done producing (if they produce). We also added a small container with chives, Thai basil, and spearmint to our patio. All three plants are starting to flourish. I look forward to fixing some Thai basil beef later this month. I do plan on keeping that spearmint contained. The regular mint took over the much of the northwest end of our fence last year and destroyed our climbing rose bush. It has even threatened the raspberry thicket. Finally, the citronella plant is growing beautifully in a pretty pot on our patio table. Just rubbing a leaf sets off the citrusy scent that mosquitoes hate. It seems to love the wet, humid weather almost as much as the cilantro. Except for the heirloom seeds from SeedsNow.com, all of our vegetables and herbs this year are from our local Home Depot, which is now selling Bonnie brand plants. Bonnieplants.com states that all of their plants are grown from non-GMO seed. Home Depot’s switch from MiracleGro to Bonnie couldn’t have come at a better time in my world. I refuse to support GMO production of any kind and won’t have my organic garden spoiled with GMO seeds.